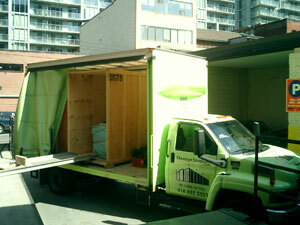 Toronto Storage provides moving and storage in Toronto and the surrounding GTA. Our portable units save you money and our customers experience a pleasant stress free move with many of them being repeat customers. We provide moving & storage for people every single day and we know that a move can be a very stressful experience for some people. But don’t panic, we pride ourselves on putting you into as stress free a situation as we possibly can. We absolutely care about the moving experience you have with us, our reputation depends on it and besides, new customers are also our potential future customers. Utilizing a streamlined process of packing and storing your belongings, our mobile moving units ensure your belongings are handled at a minimal because we only handle your items once when loading, and once when unloading, both at your location. Once our mobile moving units are loaded you stop paying our per hour fee, it’s that simple. So as you can see our streamlined process reduces the risk of damage and the cost of labor that you will pay for with any other moving company. We are not unloading your belongings from our truck at the warehouse and putting everything into storage there, we finished that part before we left your place of residence. Once we have wrapped and loaded your belongings into our mini storage units they stay there. Your belongings are not handled again until required at your final destination. Less handling not only reduces the hourly cost of labor but also reduces the risk of damage to your items. 5 of our mini storage units can usually accommodate a typically furnished 1500 sq.ft. home.